As the evening trolley #7078 headed south on State Street, carrying 63 passengers, no one suspected the oncoming accident. Recent rains had caused flooding on the next underpass and the trolley line was switched to a turnaround detour at the intersection of State and 62nd Place. 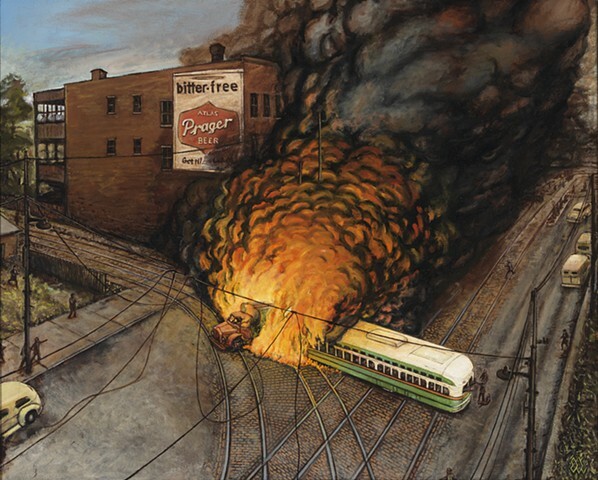 Whether the trolley driver or the trolley itself was at fault is unclear, but the Green Hornet did not slow down. As it approached the turn at approximately 30 mph, the trolley derailed as it hit a Mack truck hauling 8,000 gallons of gasoline. 30 people managed to survive despite the windows and doors unable to open. 33 people burned to death in the blaze, including the truck driver. The fire destroyed seven buildings, leaving 120 people homeless. The gruesome photos of the dead passengers ran in newspapers, resulting in arguments about whether those photos were inappropriate.